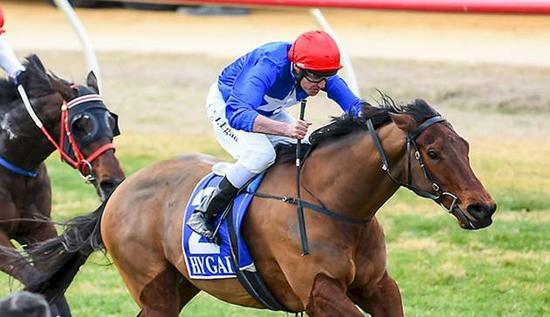 Rising seven-year-old Husson Eagle can no longer be considered only a pure sprinter after producing a devastating finish to win over 1400 metres in Friday's $80,000 Mildura Cup. In 35 previous starts, Husson Eagle had not won beyond the 1100m of the Gold Coast's Magic Millions Cup in 2017, but on Friday looked every centimetre a middle-distance horse when he treated his eight rivals with contempt by sitting back off the speed and then charging clear late. Part-owner Joe O'Neil said trainer Patrick Payne had been training Husson Eagle to get out over longer journeys after five wins between 1000 and 1100m and he said the master horseman even thinks he will run out 1600m with the proper preparation. A $42,000 yearling purchase, Husson Eagle has won more than $1 million in prizemoney and now, with a new string to his bow, can add significantly to that total over the coming seasons. Starting at $10, Husson Eagle had a length-and-three-quarters over $51 chance Setinum, with a half-length to Darren Weir's fast-finishing $2.45 favourite Plein Ciel in third place. Jockey Bill Egan refused to take any of the credit for the win, claiming the horse's trainer was the reason behind his success. "It's only his second run at 1400 metres but Paddy chose well to bring him here," Egan said. "They go a bit quick here and it was a cup race so there was plenty of speed and it turned out really well for us. "I just had to get to the outside of them and let him go."